Farmworkers lose when WA growers lose out to foreign competition - PROTECT FARMWORKERS NOW! 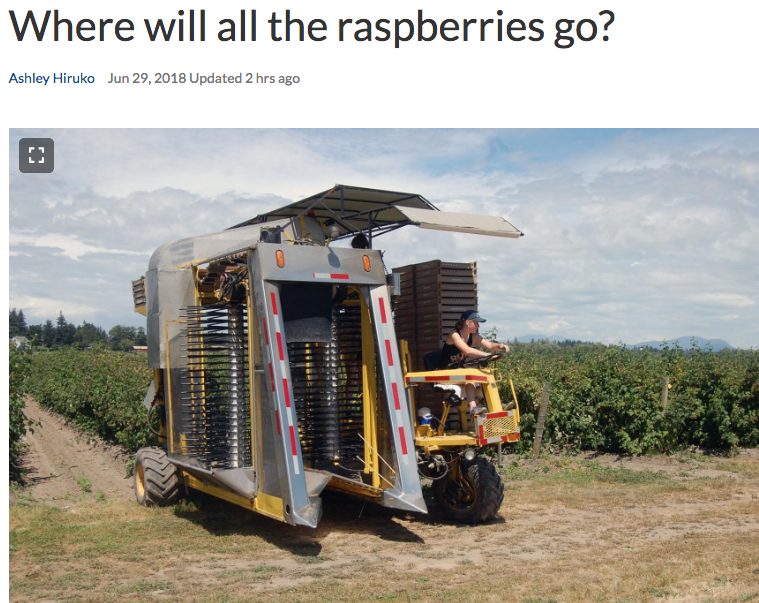 WHATCOM — Raspberry farmers knew it was a possibility. It did happen at the last minute, however, Bierlink said, just as the big commercial raspberry harvest of Whatcom County was beginning this week. SVZ, a producer and supplier of fruit and vegetable ingredients and a large buyer of local processed raspberries, notified local raspberry processors that it would not be purchasing any new berries this year. Added to this are Kerr Concentrates and TreeHouse Foods, other companies that vocalized they would not buy local berries in the amounts they have in the past. But by Thursday, SVZ agreed to return to the local market. The pullout sent local farmers into a panic. Now, some immediate relief is given, but not mitigating long-term market flaws, Bierlink said. SVZ will only purchase the equivalent to 30 percent of last year’s total raspberry crop. Quantity contracts have been sent out to local farmers to sign in agreement of these terms. For those who grow higher-quality raspberries, to be sold fresh or processed Individual Quick Frozen (IQF), the SVZ pullout wouldn’t have as much of an impact. But for farms that rely mostly on selling their fruit in 55-gallon drums to be processed for juice concentrate and other food products, the action is a huge blow. It was to be the first day of harvest at Shokar Farms at 6069 Neevel Rd. east of Ferndale. Growers were raring to go. Over $20,000 had been spent on fertilizer, sprays and inspections in preparing this year’s crop. The Shokars have packed their fruit straight into drums for about ten years. Shokar Farms, a family-run operation, reached out to a local raspberry processor at noon on Monday, June 18, co-owner Shawn Shokar said. Everything seemed to be in the clear — the processor was going to accept fruit then. But a call came three hours later with grim news. They would no longer be accepting raspberries meant to be processed for concentrate. A variety of different entities pack raspberries in the county. Most pack just what they grow, Bierlink said. Others buy fruit from other farmers. “The ones that do buy, what they’re telling us is that they can’t even sell what they have, much less buy more,” Bierlink said. Anonymous raspberry processor sources say the move by the mostly European-based SVZ company — but also with a U.S. office in Othello, Washington — could have been an attempt to bargain for a lower raspberry price. But raspberry prices have already been on a downturn in the last three years. More countries saw potential in growing raspberries, Bierlink said. He attributes emerging fruit competition, predominately from Mexico, as a cause of the lower prices. Fruit imports into the U.S. have risen steadily over the last 18 years, according to data supplied by the U.S. Department of Agriculture. More than half of fresh fruit sold in the country’s grocery stores is grown offshore. Shokar is willing to fight for a solution. He has reached out to county and government agencies. “They’re trying to do something,” he said. And he is not alone in the fight. Farmers have been sharing their worries with each other and the state raspberry commission office in Lynden has been working on various related projects to try to create better berry markets and avoid the price downfall. Farmers will now have to weigh their options — attempt to find alternative buyers of fruit, pull out plantings altogether or hope next year will be better. Picking into flats for a mid-quality grade remains a choice, but Bierlink admits “even that’s pretty limited.” “It’s hard to see how we’re going to sell berries profitably this year,” Bierlink said. Manjeet Gill, of Gill’s Berry Farm of Lynden, has been a leader in negotiations for local farmers trying to sell their raspberries. His family has been farming solely raspberries for the last 16 years. This year he plans to remove all but one field of the fruit crop — in order to maintain value on his land. He started the switch in farm produce to blueberries in May, when he planted 12 acres. Gill said he plans to add an additional 16 acres in the next few years. And others, he said, are planning to follow suit by removing their raspberry fields too.